Friendsgiving has become increasingly popular, especially as we’re now more likely to be living further away from our immediate families than ever before. Whether you’ll be marking Thanksgiving with family on the actual day, hosting a Friendsgiving party is a great way to show your gratitude to your chosen family of friends. Ready to host your own Friendsgiving this year? Roll up your sleeves and use these five tips to have a festive evening with friends at home. The best part of Friendsgiving is getting to hang out and celebrate with your friends, all of whom would be excited to share your table. Unlike Thanksgiving, Friendsgiving can happen anytime, even in December! It’s best to have it on a weekend if possible to give your friends enough time to prepare their dishes. The weeks before or after Thanksgiving are good options. Ultimately, the day you choose to have it will largely depend on who is available to join the festivities. Thanks to its casual nature, Friendsgiving is perfect for a potluck style meal. Instead of stressing over preparing the entire menu (save that for Thanksgiving), assign different dishes for your guests to bring while you focus on the main event: the turkey and gravy (or whatever the main entrée will be) to save your guests the stress of transporting a turkey (it’s never a fun task). A potluck is ideal especially if there are different dietary restrictions or preferences. Allow people with specific needs to bring dishes that satisfies their dietary needs. Friendsgiving can be as casual as you like. Remember, you’re celebrating with your friends so you don’t have to have a formal dinner set up. 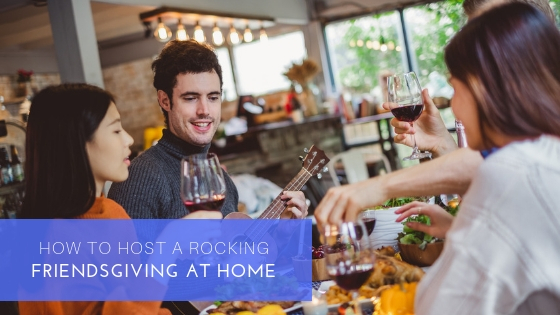 Put together a playlist, set out the food on the dining table and encourage your friends to grab a plate as they like and to eat in the living room or patio. Just be sure to enjoy yourself! As with any party, there will inevitably be some sort of mess to clean up. These are close friends; you can totally ask them to pitch in to clean up afterwards. When all is said and done, Friendsgiving is a great way to celebrate with good company, good food, and good fun.